In order to maintain thick, healthy hair, your body requires a collection of vitamins, nutrients, and minerals. When some of these essential elements are lacking, your hair may enter a resting phase and eventually thin and fall out. One of the most important minerals which helps promote strong, healthy hair is iron. If you are struggling with anemia and iron deficiency, you may notice that your hair does not have the same fullness and thickness as it once had. Iron deficiency anemia and hair loss can be frustrating but it is generally treatable. If you would like to restore your appearance and confidence, Dr. Robert H. True and Dr. Robert J. Dorin of True & Dorin Medical Group can assist you at one of their locations in New York, New Jersey, or Boston. Once we determine the cause of your condition, we can personally tailor treatment for the most lasting, natural-looking results. Ferritin is a blood cell protein which contains iron and assists in the production of hair cells. When your body is not receiving proper levels of iron, the stored proteins will be transferred from non-essential areas, such as hair bulbs, to essential tissues and organs like your heart. As a result, the normal growth of hair is disrupted and many patients experience thinning and increased shedding. Maintaining proper levels of ferritin is crucial in preventing anemia, and plays a significant role in maximizing your hair’s anagen or growing phase. Your doctor can check ferritin levels with a simple blood test. Fortified products, such as cereal, pasta, or bread, or supplements containing iron, may also be recommended. While these measures often help to improve iron levels, your body may still take months to adjust and begin regrowing hair. Your hair loss does not have to be permanent and our doctors can treat your condition using the most advanced techniques in the field. Generally, hair loss related to an iron deficiency is not permanent. However, for patients whose hair regrowth does not naturally improve over time, we can provide advanced treatments such as follicular unit transplantation (FUT) and follicular unit extraction (FUE). 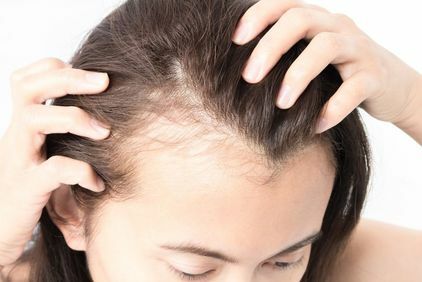 During a comprehensive evaluation of your scalp and overall health, various treatments such as platelet-rich plasma (PRP) or low-level laser therapy (LLLT) may also be discussed. Struggling with iron deficiency and hair loss can be an extremely frustrating experience. Fortunately, your hair loss does not have to be permanent. With help from our experienced doctors and the use of the most advanced techniques in the field, nearly every patient can achieve a fuller, more beautiful head of hair. If you would like to learn more about your options, please send us a message online or call (866) 629-0866.